Priest Lake Snowmobile Trails is a mapset of trails designed for upload to any map-enabled Garmin GPS receiver. In addition to being a mapset, it is also a community effort initiated to record and collect GPS data for the snowmobile trails in the Priest Lake area and provide that data for general public use. Tracks are very helpful when it comes to navigating a route, but the biggest problem with with them is that no GPS can accommodate more than a few at a time. If you are using them for snowmobiling you need to know beforehand what route you want to take and, if you are talking about even a modestly sized network of trails, you have to decide which trails to cull in order for things to fit into your receiver. That's when I started thinking about custom maps for my receiver. 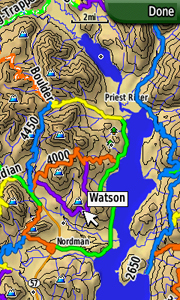 With custom maps like Priest Lake Snowmobile Trails, there is no longer a need to limit the number of trails loaded on the GPS (the maps use only a portion of map memory rather than a limited number of dedicated slots like tracks do). I set out making these maps for my own use and before too long realized that a lot of other people could probably use them, too. That's why I started this web page. 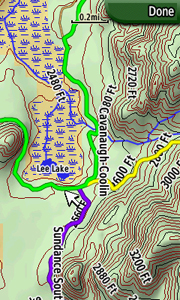 Priest Lake Snowmobile Trails is made to be "transparent", which means that when loaded with other Mapsource products (or the GPSr base map) the trails appear as data laid over the top of the other maps. Priest Lake Snowmobile Trails can also be loaded directly to the GPSr on its own. 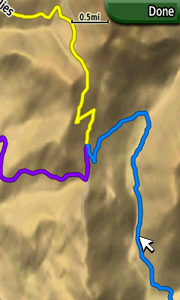 Custom type definitions (colors) are used to help distinguish individual routes and make them easy to see on the GPS screen when bouncing along on a snowmobile. 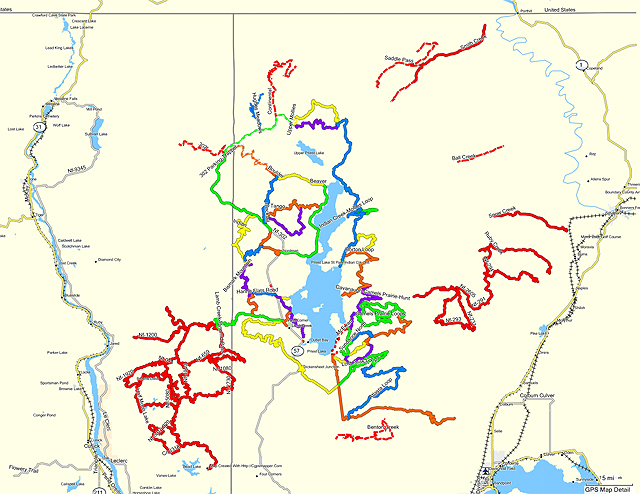 The mapset currently covers all of the trails within the Priest Lake Ranger District along with the connector trails between Priest Lake and Schweitzer. Below are a few example screenshots of the maps on a Garmin Colorado 400t. The first image shows the Priest Lake Snowmobile Trails layered on top of its companion product, Northwest Topos. The second shot shows the mapset layered on top of Garmin TopoUSA 2008. The third screenshot shows the mapset as it appears on top of Garmin City Navigator 2009. In all screenshots, the terrain shading present in the 400t's built-in TopoUSA 2008 basement is allowed to show through. The installation of Priest Lake Snowmobile Trails is straightforward. It can be utilized from within Garmin's MapSource software (on PCs) or uploaded directly to your GPS unit (using freely available utilities). For use from within Garmin's MapSource (on PCs), download the zip file from the link above, unzip it, and then execute the mapset installer. This program will install the map files and register the mapset with MapSource. Within MapSource a new mapset product entitled "Priest Lake Snowmobile Trails" will be available in the Product drop down selection list (or from the View | Switch to Product menu option). The Priest Lake Snowmobile Trails mapset should overlay any other mapset present on your GPS unit. It is important to note that when you upload maps to your receiver, the existing mapset on the unit will be deleted. This means that if you want Priest Lake Snowmobile Trails to overlay Northwest Topos maps, for example, you will need to upload the Northwest Topos map along with Priest Lake Snowmobile Trails all at once. To switch between mapsets (if more than one has been loaded to your GPS) simply toggle the hide/show settings for the desired mapsets on your receiver. The core of all of these mapsets is data. The real heart of that data is tracks recorded out in the field with GPS. Since data of this accuracy is hard to come by from government and other agencies, and I cannot possibly get out there and ride all of the trails at Priest Lake in a reasonable amount of time (although I'd like to try! ), that's where you come in! Any track data you can supply is needed and most appreciated, and will be integrated into the mapset for everyone to use. Data submission is available at the Switchbacks Data Submission page. Provided GPS data for many of the snowmobile trails in the district. Provided GIS data and support for the Priest Lake groomer routes. Provided GIS data for other snowmobile trails in the Priest Lake area.